Longstanding Maryland death/grind unit Misery Index have ended their five year drought of new material with Rituals of Power. The band varies their tempos from a slow plod to a more fast-paced death metal, the kind that is great for drawing in new fans with their very polished production and the vocal styles of Jason Netherton and Mark Kloeppel. This is a modern day death metal album on the surface level, but the band’s appreciation for the music that preceded them is evident to the trained ear. There isn’t a weak track on Rituals of Power. It is clearly the work of some very polished musicians who don’t rush to keep creating new music and let this stuff marinate before unleashing it upon the masses. It continues to reward on repeat listens, too, especially towards the end of the record where there are some subtle hints of technicality that might be missed upon first play through. “I Disavow” had a midsection chock full of neoclassically themed guitars courtesy of Darrin Morris and the aforementioned Kloeppel. 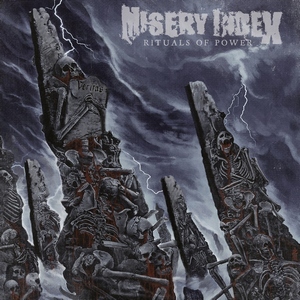 People looking for a fun, new and accessible death metal album in 2019 should look no further than Misery Index’s latest offering. Rituals of Power has a little something for each and every fan of the genre and shows off a more fun side to what can be an overly serious genre at times.